Permissions give users different access roles in your account. Change permissions at any time from the personal profile page of each user. Select a user you want to change permissions for, click on the "..." menu and select Edit permissions option. First you need to define is this user an employee, a client or a contractor. Read here about different types of users. 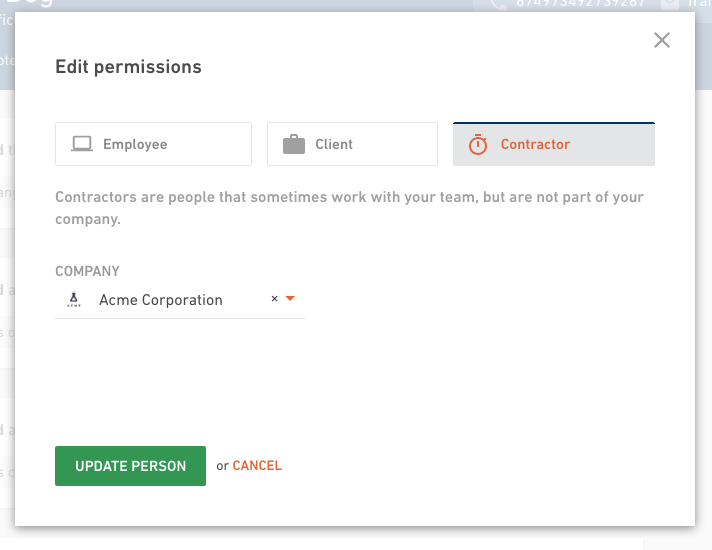 Staff is a role with a basic set of permissions. Staff can manage tasks and task lists and collaborate on projects. Staff can't access company settings, financial information or cost rates. 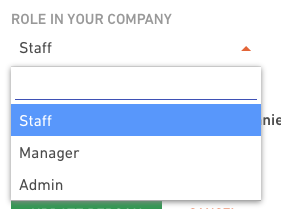 It can't manage People and companies or see other people's time entries by default. This two permissions need to be added manually to a member of a Staff. Manager is a role that manages projects/budgets and have access to all deals and budgets with relevant financial information. 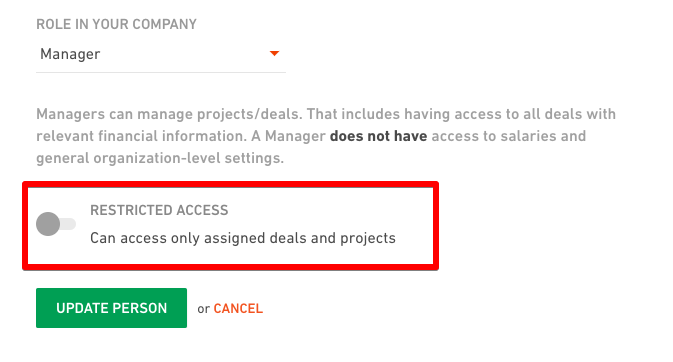 You can give your employees a manager role, but decide if you want to limit their access only to deals and projects they’re members of. This way they will only see the information about those deals and projects and not all the deals/projects in your organization. Manager doesn't have access to company settings or cost rates. Can this role add new deals/projects? 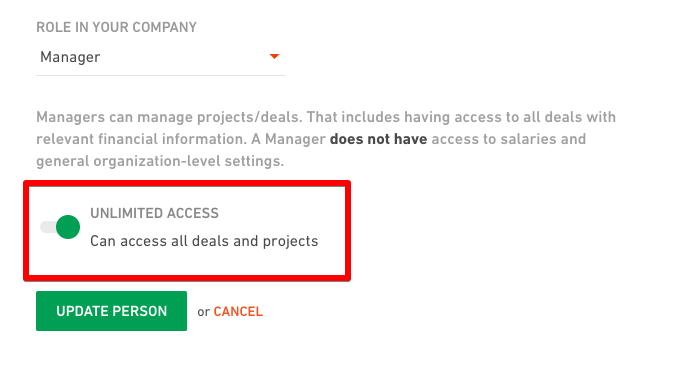 Yes, a Manager with restricted access can add new deals and projects. Admin can manage everything, including creating user accounts, managing cost rates and general organization-level settings. Clients can manage tasks and task lists and collaborate on projects. Clients can also get access to budgets and timesheets. This is a global permission setting for a specific client. To give a client an access to a specific budget, you need to go to Projects, select the budget and turn Client access on in a Timesheet tab. 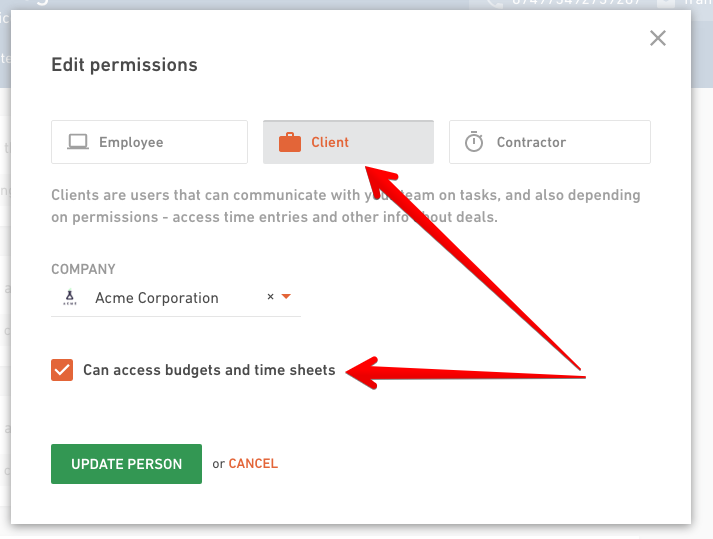 Contractors can't get any special permissions, they can only collaborate on Projects, manage tasks and task lists.